TOCNET®-Generation 4 is SCI Technology’s most advanced Unified Voice Management System (UVMS) to date. Leveraging SCI’s latest innovations for increased performance and dramatically reduced Size, Weight and Power (SWaP) and costs, TOCNET-G4 is ideal for virtually any expeditionary operation, whether at the halt or on the move. 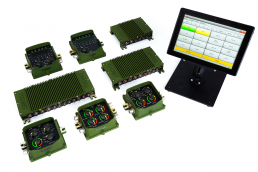 With superior capabilities and adaptable, future-proof technology, TOCNET-G4 is both a command post and vehicle intercommunication system in a single, powerful package. In developing TOCNET-G4, SCI drew on extensive customer feedback to craft a platform that outperforms the competition while cutting costs and reducing space requirements. The result is a versatile, refined system that delivers both exceptional communications capabilities and significant SWaP advantages. Trade studies and user evaluations consistently place TOCNET-G4 at the head of the pack with top ratings for intuitive operations, audio quality and performance in adverse, low-light conditions. TOCNET-G4 isn’t just the most powerful system of its kind on the market today. Thanks to SCI’s ongoing commitment to innovation, it will remain a future-proof communications solution for years to come. Inspired by the wide-ranging functionality of commercial plug-and-play technologies, TOCNET-G4 utilizes the operational adaptability of Multifunction Interfaces (MFIFs) to offer unrivaled flexibility and longevity in the tactical environment. Designed, developed, manufactured and supported in the USA at our headquarters in Huntsville, Alabama. Click here for more information. Recognized as a leader in Size, Weight and Power (SWaP) reductions. Upgradable and scalable via our advanced software-defined architecture. Future-proof with SCI's continued investments in expanded features and capabilities.